It’s easy to get in a style rut when it comes to work wear. Unlike your casual clothes, work day items tend to be more conservative and classic and, therefore, can feel boring. This does not have to be the case though! Two easy ways to update your 9-to-5 style this spring and summer are with scarves and lace. 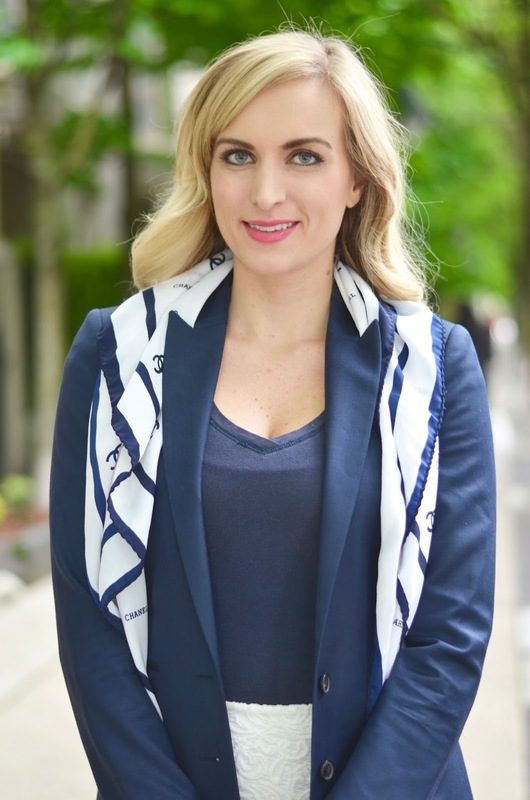 More specifically; scarves have been on trend this year and – luckily for us working women – they are easy to incorporate into business casual / office style. One way to wear spring / summer scarves to work is by wearing your scarf loosely down the sides of a blazer as I did here. It’s such an easy way to transform the look of a classic work day outfit! This is one of my favorite outfit ‘updates’. 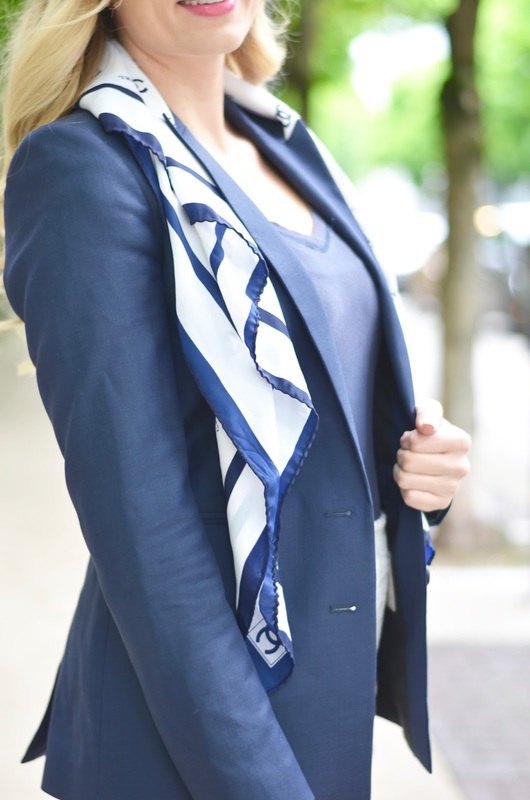 If you missed it, check out last week’s post for another way you can style a scarf for your 9 to 5. Another way to update your office style this spring is by incorporating lace. Lace is everywhere this spring and there are more and more options coming out that are work day appropriate. This lace hem skirt is my absolute favorite new piece of work wear. I love the slightly longer lace hem, and the fit is so comfortable! I definitely recommend this skirt. Today is a short work day for me – I am only working until lunch as I am headed out this afternoon for a long weekend vacation! Follow along on instagram or twitter for updates on where I am headed and some of my trip behind-the-scenes! Ah I love it – great minds think alike! And yes, I totally agree – very corporate offices versus tech or PR companies definitely dictate a change in appropriate work attire. That is a stylish 9 to 5 look! I love how wore a lace skirt because it is so feminine. The love how you paired the skirt with that blazer! It definitely adds some sass! Thank you so much! It belonged to my grandmother, so I just love it! The woman had impeccable style! This whole look is absolutely gorgeous! Loving the navy and white! Also love the chic Chanel scarf to really vamp up this outfit, so cute! Thank you so much! The scarf felt like a nice touch to add a bit more of an interesting element to the look! Such a great navy and white outfit. That scarf is absolutely beautiful! I totally agree! something about the combination is just so summery. Thank you so much for stopping by ada! Happy Monday!